All the BAR competitions for 2015 appeared to have been settled last week, but it was a pleasant surprise on a pleasant autumnal evening when Kathy Miller showed up to ride the hill climb, and gave the Women B BAR trophy a home for the next twelve months. Shane Rush was the fastest on the night, just two seconds outside his personal best and course record of 2:27, set in 2012. Afterwards the riders and volunteers, plus a few more members and friends, enjoyed the rest of the evening over beer and pizza. The final disposition of the remaining BAR trophies was settled tonight. Lorne Dmitrik nailed down the Master C trophy, and Aaron Mumby retained the Master A trophy for the third year in succession. Gail Wozny topped off the women’s Master C BAR with a strong ride on the night. 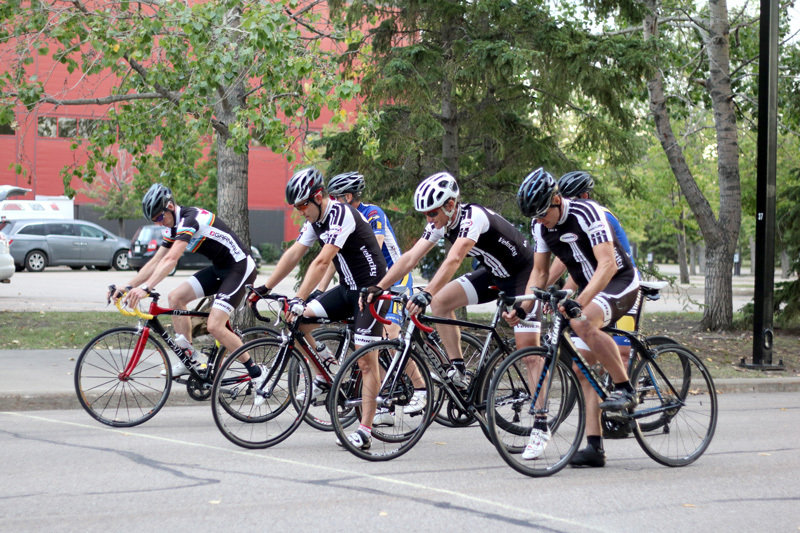 We had the best two hours of the last two days for the final criterium event of the year. The multi-group handicap format seemed to work out well, with some strong riding by the 20-second and 40-second groups keeping the scratch group at bay. Thanks once again to the volunteers who came forward at the last minute to keep the wheels rolling in anger , and thanks to ABC Press for providing a special award for tonight’s winner, Rejean Lavoie. A few more trophies found their new homes for 2016 after a fast, last time trial on a cool but calm evening. Bruce Copeland secured the Maurice Johnson Memorial Cup for the Age Standard competition by a wide margin. Lorne Dmitrik can’t be beaten for the Master C BAR, but could theoretically be tied for first place. Shane Rush cannot now be beaten for the Master B BAR. The only remaining fight for first place is in Master A, where Aaron Mumby has a slight lead over Dan Nelson with just two events to go. A cool and breezy evening, and the farmer across the road was busy taking his feed crop (I think that’s what it was) off, which resulted in a few rather large farm implements and trunks trundling up and down the highway, fortunately without incident. After the event there were some rather large and impressive storm clouds to be seen off to the northwest, too. Bruce Copeland has almost certainly secured the Maurice Johnson Memorial Cup again; Lorne Dmitrik and Shane Rush ably defended their leads in Masters C and B respectively; Aaron Mumby took over the lead in Master A. Despite air quality warnings the race went on, but only thanks to some last-minute volunteers stepping up once again. Four events to go, and Aaron Mumby and Dan Nelson continue in lock-step in Master A. Rejean Lavoie may be making a late-season rush (Shane, are you paying attention?) to overcome a self-imposed handicap of five weeks vacation, in an effort to retain his Master B BAR title. The placings, if perhaps not the overall, in Master C could still change before the end of the season. A good turnout for the last criterium omnium of the season (the September criterium is “just” a regular 25 minutes plus 3 laps bash), and some good racing, despite the odd raindrop or two. Thanks to Joshua Mumby for helping out with the bell. On a hot, calm evening with long shadows cast by the low sun, a member of the driving public took the time to stop and mention to the volunteers that it was hard to see the riders, and that perhaps they should be wearing (hi-vis) vests. It is a good idea to ensure that you are as conspicuous as practicable, especially in low or difficult light situations, and I understand that is is quite common in the US now for riders to have a small flashing red rear light at all times. With six events to go, it looks as though Sid McKinney will retain his Master E BAR; the Master D BAR will stay with Peter Heppleston; Lorne Dmitrik could be heading for the Master C BAR; the Master B BAR still looks like the Velocity CC Club Championship; and Dan Nelson and Aaron Mumby are neck-and-neck in the Master A BAR. With only two 20+ km time trials to go, Bruce Copeland should win the Maurice Johnson Memorial Cup quite handily. Once again the afternoon weather faltered to deceive – at 6:00 pm it was still raining at the Reformers church, but it quickly dried up and by race time we were enjoying another sunny summer evening. Although there were rather nasty-looking clouds building up an hour or so before start time, by the time the race got under way it was sunny, cool, with fairly light winds and no mosquitoes. So all-in-all we had another good night for racing. With the season more than half over, Sid McKinney and Peter Heppleston look to be well on their way to retaining their Master E and Master D BAR trophies, but in Master C Bruce Copeland and Lorne Dmitrik are now tied for first place. Shane Rush is holding on to the lead in Master B, ahead of two of his Velocity team-mates, while in Master A Aaron Mumby and Dan Nelson are once again vying for the overall win. So far this year we’ve only had four women competing at six events, but never more than one woman at any one event, which is a bit disappointing. Bruce Copeland padded his lead in the Age Standard Competition for the Maurice Johnson Memorial Cup, but apparently he will miss the next two events, and with every time trial counting this year this could end up going down to the wire. 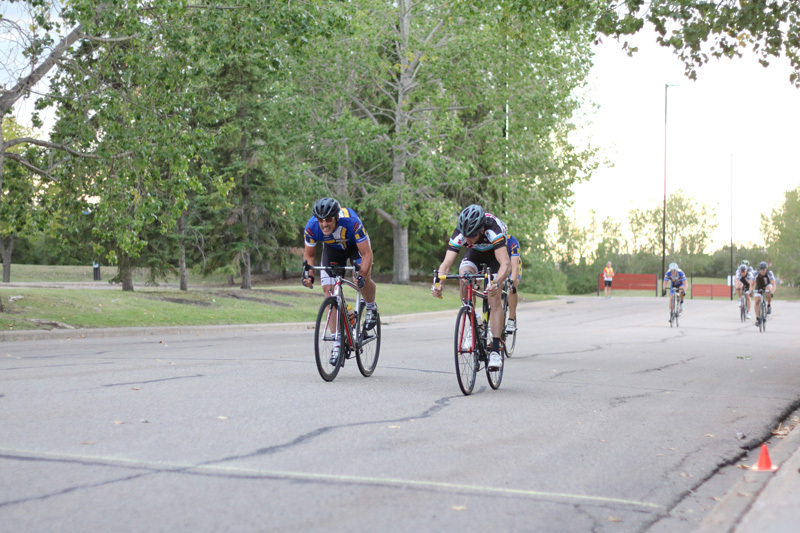 Perhaps it was the seemingly dark and stormy night that kept the number of riders down, but the few drops of rain that did fall on the Research Park pavement never joined up and all the racing went on as planned. Dave Embury punctured riding out to the event, didn’t want to take a chance on rolling his spare tubular, and so was able to stand in as a last-minute replacement volunteer and goose-herd. The carefully-planned 30.4 km course with a safe turn was cut down in its prime to a mere 25.9 km. Don’t ask me why, because I don’t know why. Other than that it was another good night’s racing, and Bruce Copeland appears to be galloping away with the Age Standard Competition for the Maurice Johnson Memorial Cup. For a change there is more to say than we had a good turnout again (averaging 25 members – riders and volunteers – per event this year so far), that it was a good evening again (it was quite the best evening we’ve had this year), and thanks to the volunteers (after the call went out we had more people volunteering than we could use). For some reason, the “fast” group bunch allowed themselves to be caught by the “slow” group (comprised mainly of 60- and 70-year-olds), hence the *notation in the result, as this affected the allocation of BAR points within the Master B and Master C age groups. In the EMCC Code of Conduct there are prescribed penalties for unsafe riding and unsportsmanlike conduct during events. If you haven’t read the Code of Conduct in a while, it may be time to refresh your memory – it can be found on here. It looked like a nice evening again, but there were a few moans afterwards about a funny wind, cold air, something in the air, etc. But the sun was shining and it didn’t rain and there’s always another race. Peter Maser made the long trip from Penticton, and just like the bad old days both Jean-Claude Coupal and Tom Mumby rode out to the event (and home again afterwards). Once again thanks to all the volunteers – another job well done. That was one of the best evenings at the Research Park in a long time – not much wind for a change, no gooseherding required (as far as I saw), and competitive racing. The Men B BAR is starting to look like a Velocity CC club championship, while the Men C is in the hands of Juventus at the moment, with Velocity not far behind. Thanks to all the volunteers, especially the last-minute volunteers who stepped up to make it happen. Once again we enjoyed a pleasant evening on the latest version of the Joseph Lake road course. The wind wasn’t as bad as the forecast sounded, the bugs weren’t as bad as they could have been, and the turnout continues to be good. Another reasonable turn-out of riders and all the volunteers fought their way out of the city through the worst traffic chaos in recent memory. The gusty wind was a bit tricky on the last lap, but at least we didn’t have any rain. 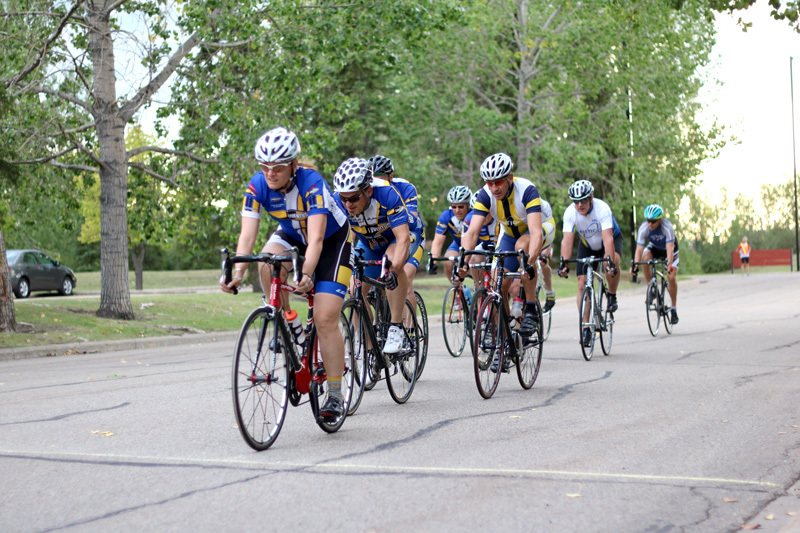 Nice to see Bree Erickson and Dan Edgcumbe tackling their first-ever road race, riding strongly and finishing well. Some of the 2015 BAR competitions are already shaping up. While there’s a log-jam at the top of the Men C category, Rejean Lavoie already appears to be fielding a strong defense of his Men B BAR title. Aaron Mumby and Dan Nelson once again are duelling for the Men A BAR. And we may have a battle shaping up for the Women A BAR, too, with both Margaret Chen and Bree Erickson – two strong riders – giving racing a go this year. 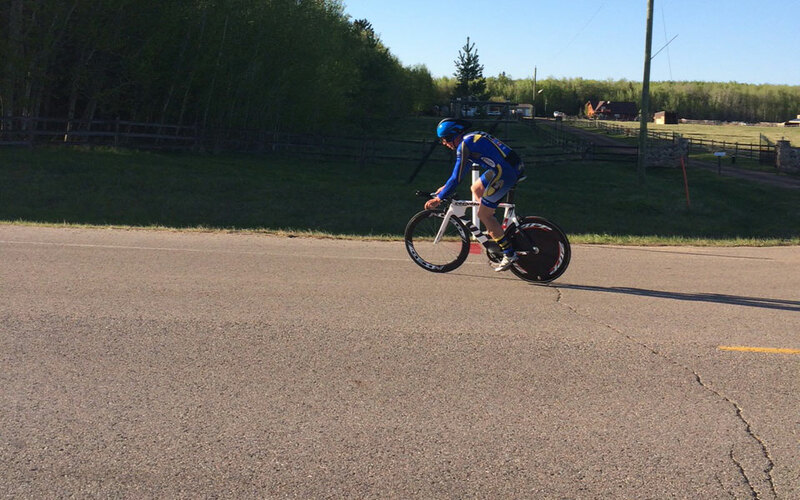 The first event on the new 20 km course on TWP 520 enjoyed a sunny evening, and the biggest turnout we’ve had in a couple of years. 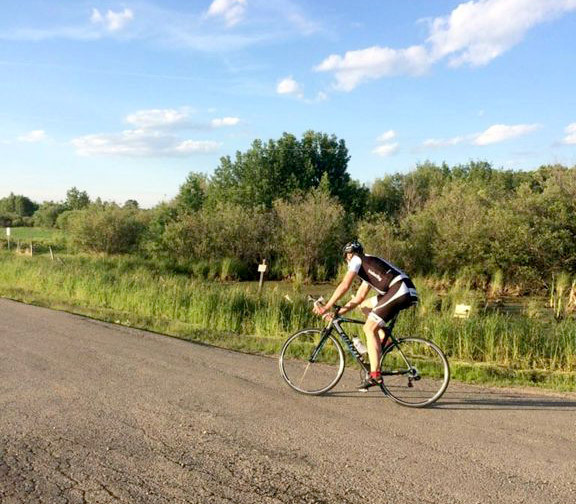 There were some reports of riders battling monster dogs and hordes of insects, and the volunteers recorded the first mosquito bites of the season. (FYI, there is insect repellent in the race bag, guys.) There were three people who rode on regular road bikes, with no go-faster aero bits, so bear that in mind when perusing the times. Afterwards a couple of dozen of us enjoyed beer and pizza – you should have been there, there were almost two jugs of beer (but no pizza) left over. 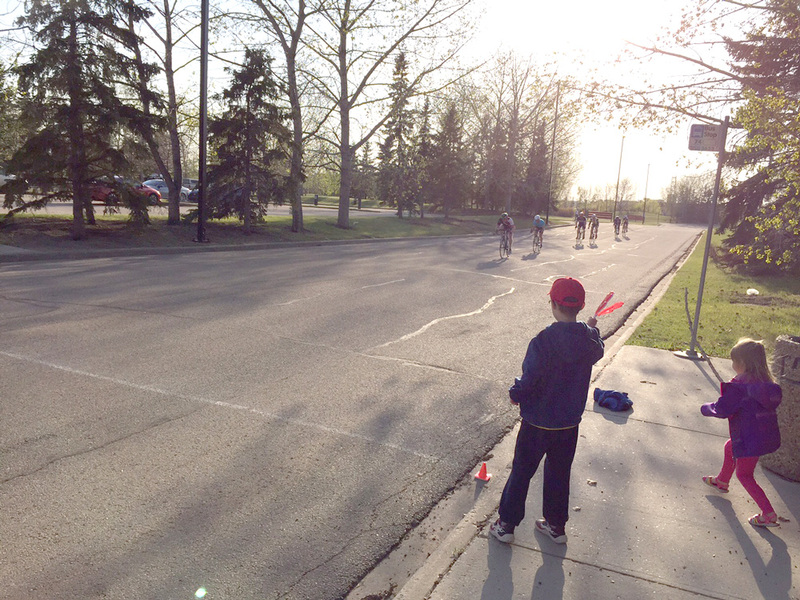 The midweek season finally got under way on a sunny, pleasant evening at the Research Park. The turnout was good, the racing was good, and the geese were well-behaved. 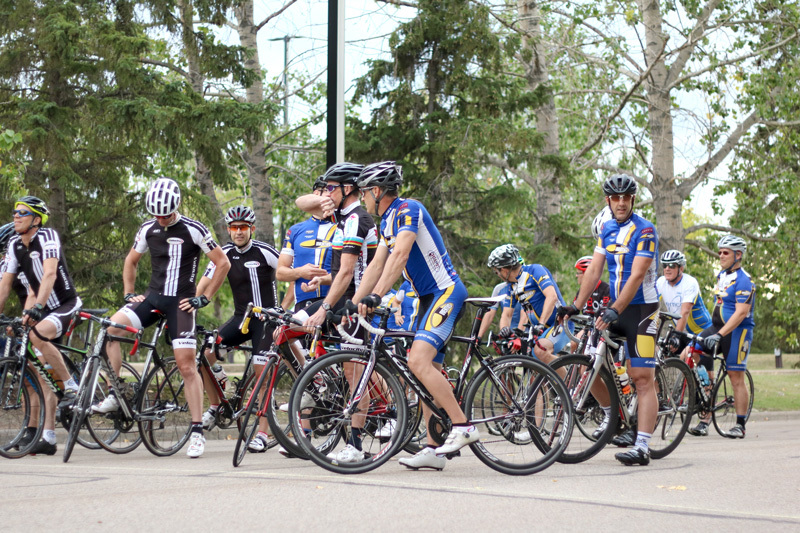 Thanks to the volunteers who managed the chaos that is bike racing, made sense of the results, and kept us all safe.